Tarig Monastery’s location is great. 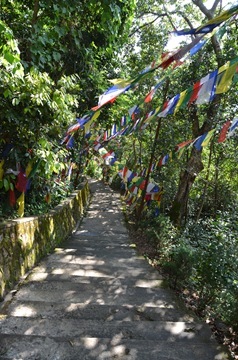 Taking a circumambulation around the monastery happens to cover all the sacred sites at Pharping. 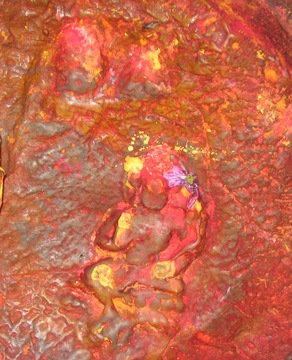 In the Tarig Gompa, there is one self-arising Tara image which they discovered underground when building the temple, colored by the previous Tarig Rinpoche, and now kept inside the main stupa. 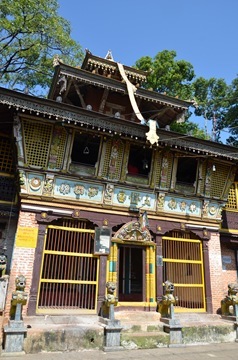 Next to the Tarig Monastery is a monastery with self-arising images of Ganesh and Taras. I do feel the Tara becomes even clearer than 4 years ago. Also the 2nd Tara on top of her which I could not recognize in the last time, can now be effortlessly seen. 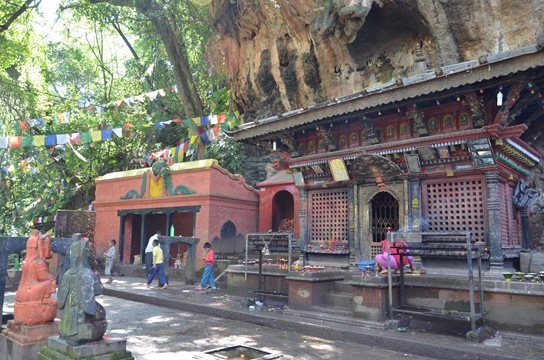 Further up the hill, right on top of the Tarig Monastery is the Asura Cave where Guru Rinpoche practiced and accomplished Kilaya. 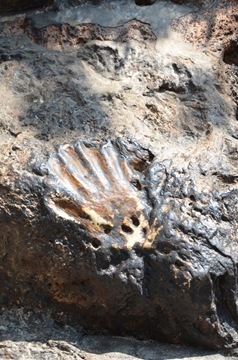 The cave is not big and the hand print at the entrance, said to belonged to Padmasambhava remains intriguing. Coming down from the Asura Cave, we reached THE Vajrayogini Temple. Naropa transmitted this vajrayogini practice only to two Nepalese – the Pangting brotheres. It’s believed that Pharping is where they lived and attained accomplishment. Today is some sort of special day. 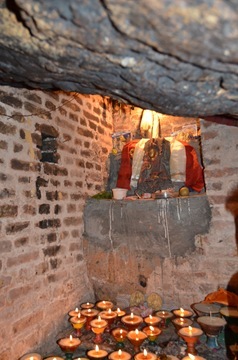 The priest in charge of the temple did a special offering and prayer to the yogini statue. He would offer food and flowers to the statue. The way he offered flowers is not like we Chinese just offer a bundle in front of the statue, but actually adorn the statue with individual flowers one-by-one. At first I found it a bit funny, but after a while it did feel somehow divine. Then the priest closed the temple, gave us and three other monks who happened to be in the shrine room a special blessing. When he sprinkled water to us from a distance, my face actually felt hurt with the water drops! And then he picked a seemingly rotten pear on the ground beneath the Vajrayogini statue, torn off the pear leaves and placed them on our head as blessings. When he finished, he bestowed me that pear. An of course, it was all due to my impure perception. The pear was not rotten at all. It just looked not so perfect as the supermarket fruits, must belong to the heirloom genre, hence a really special blessing from the holy land. 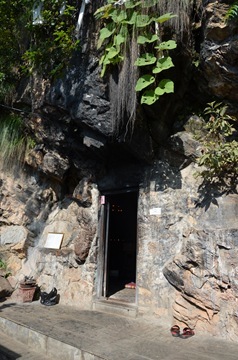 Then we walked by the Pharping market to visit the Yanglesho Cave, another Guru Rinpoche meditation cave. Between this one and Asura Cave, not sure which one is for Yangdak Heruka (Vishuddha Mind) and which one is for Vajrakilaya though. Usually the cave is locked but today is really special. It is open for public worshiping. So I fortunately stayed inside for a short while. 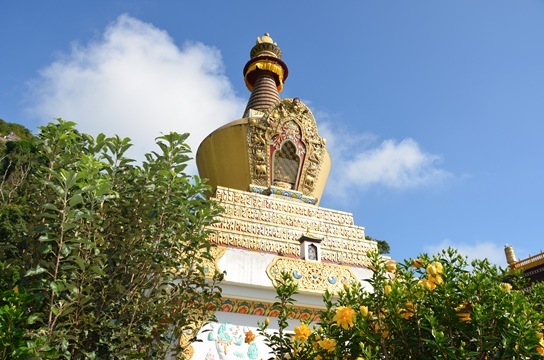 Only toward the end of the day, we finally realized today is Dasai, the Nepalese New Year-like festival, so that it is indeed an auspicious day to visit these sites. To the contrary, if you happen to visit Hindu sites on this day, it would be a very bloody scene as today is the day they sacrifice live animals in Hindu temples…OM MANI PADME HUM.